Here stands a photo of my last meal. Well, that’s not entirely true. It’s the last thing i cooked before i started my fast this week. In addition to not eating (it’s only for two days…but…two days!?! ), Typepad hasn’t been letting me work on the blog here…so things have been a little rough around running with tweezers. 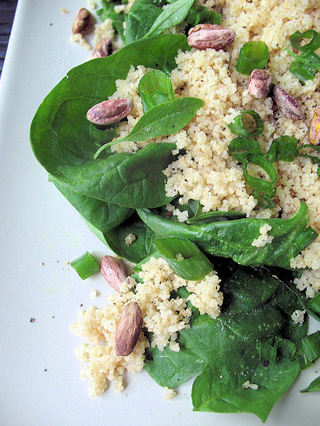 Trying to think back on this salad (it’s been days…and days with no food…memory…a…little…hazy…), I came across this recipe browsing through this month’s Everyday Food. Say what you want about Miss Martha, this is a cute read with lots of easy recipes. Not having had couscous in a while, this salad stuck out. It couldn’t have been easier to throw together. From start to finish, assembly took about 10 minutes. The most taxing thing about it was picking the basil leaves off my plants. For a little extra healthy spin, I used whole wheat couscous. When seasoning the couscous, I also threw in some garlic and red chili flakes for some extra oomph. Don’t skimp on the seasonings, whichever ones you choose – it soaks up a lot of flavors. season to taste with salt and pepper. Turn off heat; stir in couscous. before serving, toss all ingredients together. I am so happy to see something from Everyday Food in your blog! I love this publication and everything about it – the design, the size, not to mention that I end up trying at least 4 or 5 recipes out of every issue. So many of these have become permanent additions to my favorite “from memory” recipes (chocolate-ginger pudding, teriyaki wings, and the kirby and dill salad from this same issue you mentioned). I must’ve missed this one though. Can’t wait to try it! I am a fan of Everyday Food as well. The recipes are definitely doable. Oh my, I don’t think I could fast! 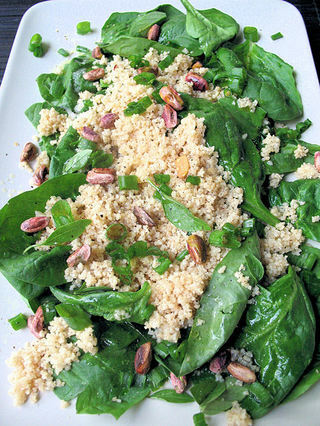 The salad looks wonderful, I love coucous! Fasting – you are a brave girl. But, you might want to put the tweezers down for the duration. This salad looks yummy! I have always had good luck with the recipes that Martha’s staff comes up with. I hope you are doing well with your fast! Your “last salad” looks delicious. Like you, I prefer to use whole wheat couscous, I like to add lemon juice instead of vinegar.